Enter the world of Digimon comics, based on the smash-hit animated series from Fox Kids! A group of seven children at summer camp accidentally discover mysterious digital devices that transport the kids to the Digiworld -- a strange, wondrous land populated by fantastic digital monsters, or Digimon! Some Digimon are friendly, some not so friendly, but the castaway kids are befriended by seven small Digimon who have the ability to evolve into more powerful forms to help protect their human pals and the Digiworld from mysterious dark forces bent on turning all Digimon to evil! Kids worldwide are going wild for Digimon cartoons, toys, and games, and the momentum is still building! 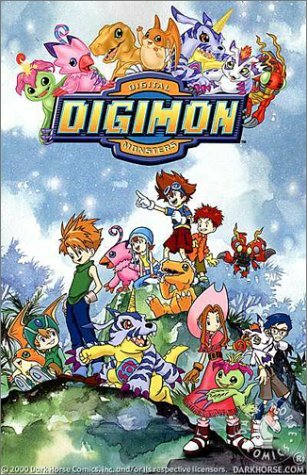 When it comes to action and adventure, Digimon is the champion!